In this photo, a woman is emerging from the Balasan River near Siliguri, West Bengal. 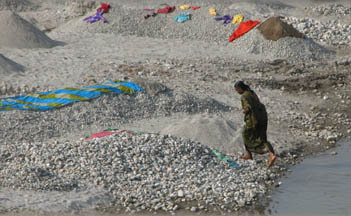 On this day in early January 2008, many people were washing their clothes in the river and drying them on top of the mounds of gravel and rocks scooped from the almost dry river bed. We crossed the Balasan River on this trip from the Bagdogra airport to Kalimpong. The journey was accomplished with a large bus for the Colby students and a newish American SUV/Jeep-like unit. We had a driver who was so thrilled with the fact that it had a turbo-charged engine, he flew up the mountain at terrifying speeds. I must admit that he was in control, clearly knew the road and the loose rules of “engagement”, i.e. 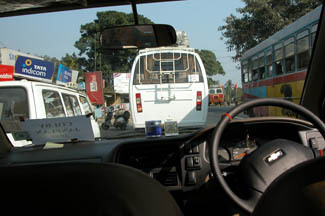 when to yield to pedestrians, chickens, cows, rickshaws, and how to properly blow one’s horn most of the time, especially while passing everyone with only inches to spare. It reminded us of the many exciting rides we had in taxis during the time we lived in Mexico City. The van full of Colby students from our car. 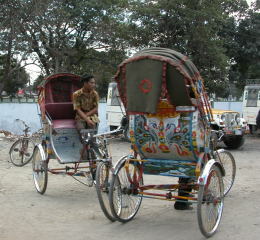 We finally arrived at the Gandhi Ashram school at about 5:00 p.m. and were met by the staff there. The children at the school are absolutely beautiful. They are Indian, Nepali and Tibetan (and some are a mix). 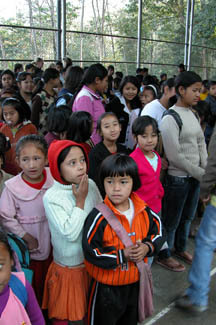 Some of the children look Chinese as well. 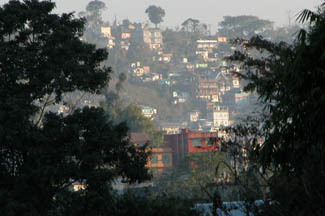 The first assembly at 8:30 a.m.
A view of part of downtown Kalimpong from the balcony of our cottage. I mistakenly deleted this page while trying to edit it, so I lost all posts. To answer your question about weather, it gets down to 35-40 degrees F. at night and can get up to 70 during the day, if it’s not cloudy. Today we ate lunch sitting in the sun and it was lovely! We miss you, too. We’re looking forward to seeing you when we return.